In a large saucepan, begin by heating olive oil over MEDIUM heat. Then add onions and garlic. Cook and stir until onions soften. Add oregano, cumin and chili powder and continue to mix. Add the crushed tomatoes, chicken broth, and the rest of the sauce ingredients with the exception of the cilantro. Mix well and bring the sauce to boil. Cover and simmer sauce in LOW setting for 15 minutes. Remove from heat and blend the cilantro. Except for the grated cheese, combine all filling ingredients and mix thoroughly in a large bowl. Keep the grated cheese separate and nearby. Preheat oven to 375°F and spray one baking dish with Canola spray. Add 1/2 cup enchilada sauce to filling and mix thoroughly. Working with one enchilada at a time, spread a about 1/3 cup of filling in center of tortilla. Then, top with a tablespoon of grated cheese. Roll up tightly and place in baking dish. Repeat until all 10 tortillas are used up. With a spoon, cover each enchilada with sauce. Top with grated cheese. Spread cheese as evenly as possible. Cover dish with aluminum foil and bake in oven for 30 minutes. Remove foil and bake another 5 minutes or until cheese is bubbly. 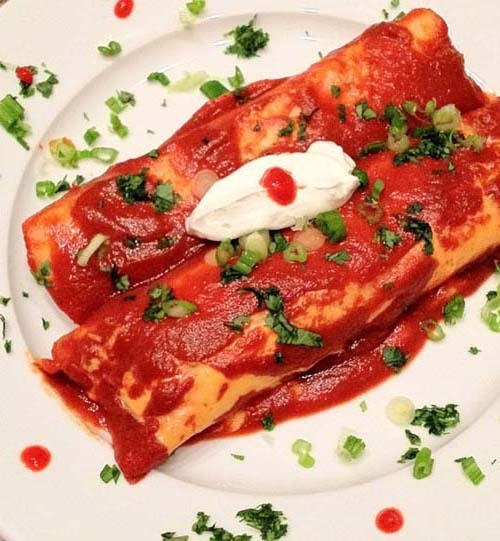 Let cool for a few minutes and serve enchiladas topped with sour cream and green onions. Here's the great thing about enchiladas: you can serve them solo as a complete meal or you can serve them in combination with rice and beans. 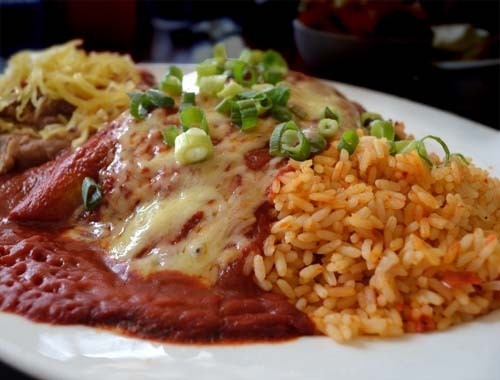 Combining with rice and beans seems to be popular here in the Mexican restaurants in California. I don't know if that's a tradition in Mexico. Nevertheless, these combinations are fantastic full meals. Also, if you have leftovers, such as when you made too much enchilada filling or you don't have enough tortillas, make enchilada soup. 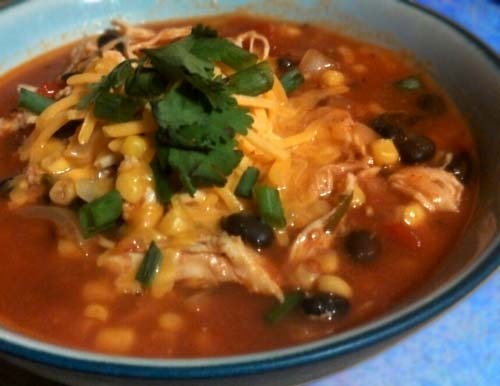 Just combine the leftover filling and sauce with chicken broth and canned vegetables, heat in a saucepan, and top with grated cheese and cilantro. Also yummy!